Or view larger version. University of California, Berkeley, students who support the Third World Strike get into a scuffle with police. February 4, 1969. Lonnie Wilson, photographer. Gelatin silver print. Collection of Oakland Museum of California. The Oakland Tribune Collection. Gift of ANG Newspapers. The Civil Rights Movement and demands by African, Asian, Latino, and Native Americans came to fruition on college campus throughout the United in the late 1960s. Feeling that their specific concerns were ignored by mainstream academia, students of color demanded that colleges create Ethnic Studies Departments with minority teachers to conduct classes and research into minority issues. In 1968, students at the California State University, San Francisco, began a student strike of the school called the Third World Strike, until an Ethnic Studies Department was formed. 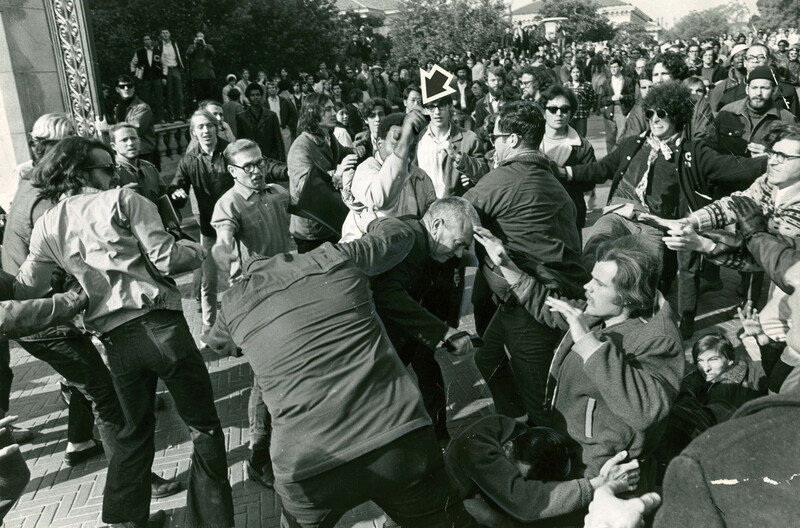 In January 1969, the strike had spread across the Bay Area to the University of California, Berkeley campus. As part of their strike, students at the Cal campus refused to let people pass through Sather Gate, a main thoroughfare on the school. This quasi-blockade led to violent clashes between student strikers and police who tried to clear them from the gate and allow normal traffic through the school. One such clash is pictured in the photograph.